In a recent conversation with a neighbor, I mentioned the success that the Providence campus of Johnson & Wales University has had in increasing its draw rate at a time when draw rates plummeted for other colleges and universities in the region. My neighbor remarked that a healthy draw rate could easily be negated by a lousy retention rate. Students need to stick around after they’ve enrolled. X axis indicates fall semester of academic year. 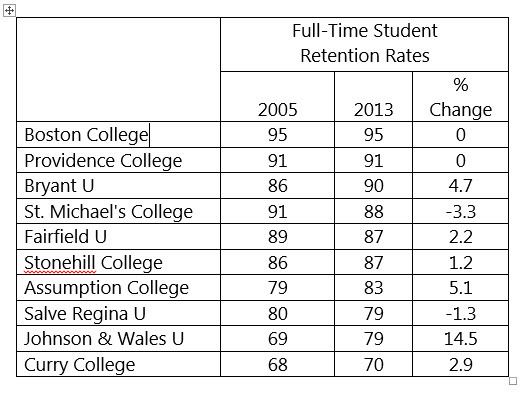 What we see is Boston College (BC) with a retention rate consistently at 95 percent, which is not unexpected given BC’s prestige. 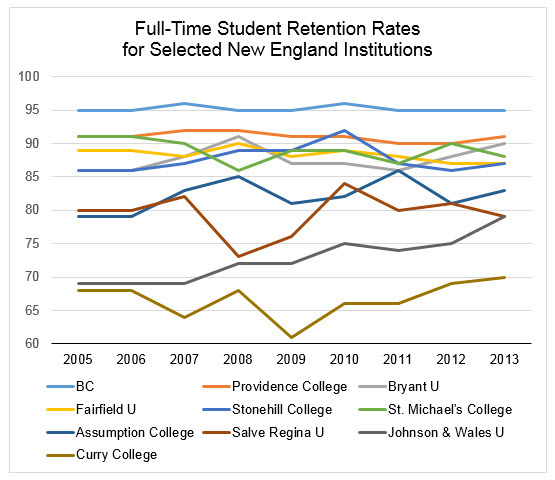 Below BC is a cluster of schools (Providence College, St. Michael’s, Fairfield, Bryant, and Stonehill) with an average retention rate of between 92 and 88 percent. Assumption College’s and Salve Regina University’s average retention rates are 82 percent and 79 percent, respectively, though the latter suffered a sharp drop in retention in 2008 and 2009. At the bottom is Curry College, and Johnson & Wales University is second from the bottom. Once a school’s retention rate hits 90 percent, it probably becomes very difficult to regularly push the rate even higher. So the flatness of the lines for BC, Providence College, Bryant, Fairfield, Stonehill, and St. Michael’s at the top of the graph above should perhaps come as no surprise. For the schools in the sample that fall below this top band — Assumption, Salve Regina, and Curry College — fluctuations in the retention rate might reflect random noise. There is no clear upward or downward pattern. Whatever efforts these schools made to improve retention during this period of time seem not to have worked very well. Johnson & Wales is again the exception. Its retention rate steadily increased, ending up a full ten points higher in 2013 than in 2005 — a gain of 14.5 percent. As shown in the table below, this is by far the largest percentage gain of all the schools in the sample. Like the draw rate, the retention rate indicates that Johnson & Wales’ enrollment management strategy is working.